Hot Marlin, Sailfish, Tuna bite! Puerto Vallarta - - - This thread has 1 message. Showing 1 through 1. Red hot Marlin, Yellowfin Tuna and Sailfish bite! Puerto Vallarta fishing does not get much better than this! El Corbetena has been the hot spot for Marlin averaging 100-400 lbs. 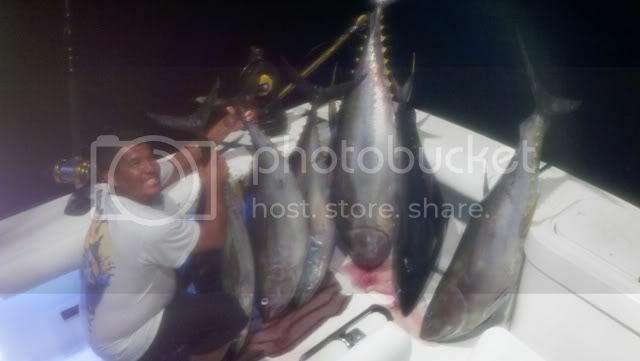 , Yellowfin Tuna and Sailfish , also a couple Sailfish were caught last week outside of el morro. Lots of smaller tunas, and Snapper s, and some Sailfish at Marrietas Island, And of course there is Yellowfin tuna everywhere inshore either infont of Yelapa on the southside of Banderas bay or Marietas on the north side. Inshore tuna's expect 10-40 lbs. Offshore Tunas averaging 50-150 lbs We have not seen any cow's yet but caught 6 nice Tunas yesterday and they seem to be getting bigger in size everyday so get ready for some Cow Tuna reports soon .